Some days there's nothing more refreshing than a tall, cool glass of lemonade. Other days, nothing makes your day like curling up with a good book. The best day ever... when you can so both!! Carrollwood Day School, an independent school in Tampa, Florida has figured out a way--with a little dash of technology--to do both! Carrollwood Day School [CDS] teachers have a program they run annually called CDS Reads. It started out as a literacy program to capture the love of reading within their student population. They began by giving every family in their school a copy of the same book to read for a school-wide, shared reading experience. Yet for this third season of this program, with a little help from the Internet and the ease these days of website creators, this school project was able to become global!! Which is perfectly suited for CDS given it is an International Baccalaureate School! Why limit yourself with just a school community of readers, when truly the sky is the limit?! 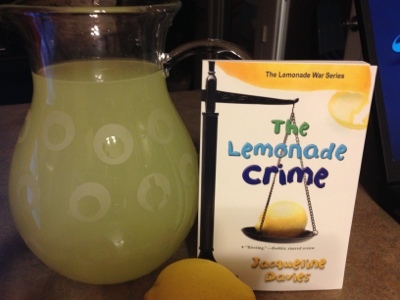 This season's read aloud is Jacqueline Davies' book "The Lemonade War" which is the first in her series by the same name. In the book, Davies pits brother against sister in a competition with entrepreneurial spirit. They each are working hard to beat the other out at the end of the summer by being the one who earns the most money selling lemonade. My kids and I were snuggled nightly on the couch, waiting to see what triumphs, trials, and tribulations Jessie and Evan would face in the latest layer of "The Lemonade War." The story did not disappoint! Nor did the concept. It was entertaining to hear each new chapter read by a new teacher--each adding in their own nuances, voices, and slant to the storytelling. What the world needs are more websites like this that promote the love of reading while also providing an enriching family experience! 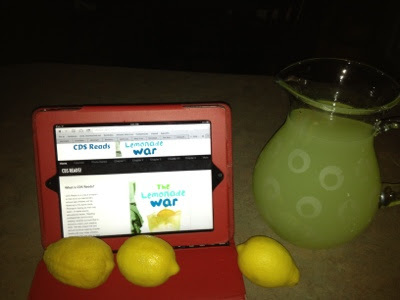 "We thought that the 'Lemonade War' was a cool, awesome, extremely amazing, "cash-tastic" book. It was a good story about money-making, friend-making, lemonade-making...and the importance of working hard, saying apologies, and caring for your family. Even if your brother or sister sometimes makes you crazy! ;-)"
I can't wait to settle in with the sequel "the Lemonade Crime." Thanks! It has been so much fun and we are thrilled to have you join us. We have thoroughly enjoyed taking part! So much fun on this side too! What a great way to build a love a reading and be part of a community together!